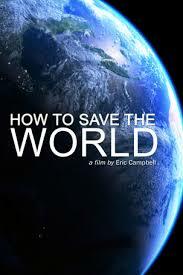 The Waco Friends of Peace/Climate documentary film for November is How To Save The World. Climate change is the greatest challenge of our generation. From the melting glaciers to the droughts of California, rising temperatures are a worldwide problem that impact us wherever we live. Director Eric Campbell criss-crosses the continents to see just what is at stake for humanity, interviewing scientists determined to find solutions as well as politicians who deny its existence. This film offers fresh insight into this pressing and global issue.